This map was collectively named by a group of more than a dozen players. 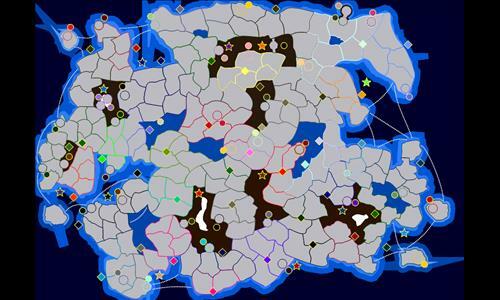 The first test map of the Other Realm consisted of unnamed territories and no bonuses, which was played with the 'Extra armies for territories' setting. During play, if a player owned a territory they could name it; if they owned 2 or more territories they could make a bonus. Thus was the map named, and bonuses created. Players also designated ("built") and named structure bonuses during the course of play; castles, fortresses, and temples appeared. Thus from a nameless bonusless emptiness this map organically took shape through actual gameplay and the creative input of numerous players. Review by Urfang on 7/28/2017. Bonuses are slightly chaotic but it makes this map unique. Thanks for invite to creation.